Harness the power of the IoT with proven analytics and scalable solutions that deliver innovative outcomes and tangible business value. IoT is beneficial in term of improving customer satisfaction, creating new opportunities for business, offer quality inputs for marketing and much more. At Flexsin our team is keep updated with the emerging IoT technologies, designs and strategies. Our aim is to deliver efficient IoT solutions to accomplish diverse industrial needs of our clients and heighten their business to the next level. Consulting Provide consulting services and create IoT roadmap that helps in executing successful strategy for IoT or machine- to-machine. Implementation Explore different components of IoT like standards, network, sensors, etc. to eliminate any type of complexities comes during its implementation. Management Management of IoT device includes its authentication, provisioning, software updates, control, maintenance and much more. IoT technology can have a profound impact on every aspect of your business. We identify opportunities to make your enterprise more agile and adaptable. From there, our extensive capabilities mean we can deploy innovative IoT solutions alongside your legacy systems. With enterprise integration, we allow the businesses to map the data from the platform to enterprise applications in real time. the enterprise receives maximum ROI out of its software investments. Devices and objects with built in sensors are connected to an Internet of Things Platform. 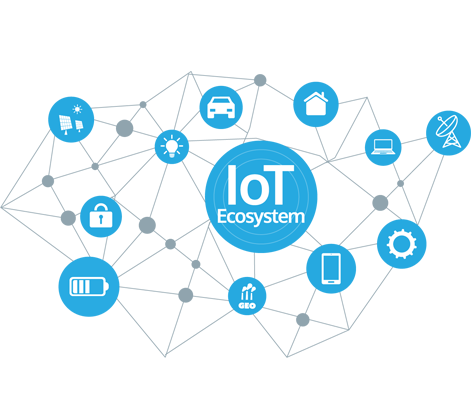 The IoT platform integrates data from different devices and applies analytics to address the specific needs. The information is broadcast from the device, which is received by the backend analytics system and the message delivered over the network. The information can be used to detect patterns, make recommendations and prevent the occurrence of the possible problems. Automotive IoT enables a vehicle to become intelligent that connects itself to the cloud to manage its diagnostic and driving behavior. IoT connected automotive create safer and productive journeys through personalized experiences for drivers and passengers. Integrate IoT features with medical devices which help in improving the quality and efficiency of the services. Connectivity of healthcare solutions improves outcomes of treatment and disease management, and monitoring can be done in real time, significantly reducing costs. Transform retail industry by delivering smart IoT solutions for managing inventory system and improving sales. IoT for smart retail enables stores to transform customer service relationships, saving time and money, while providing seamless shopping experience. Optimize the business production with M2M/industrial IoT solutions to reshape industrial boundaries of the companies. Solve your toughest industrial challenges, achieve higher productivity and sales with advanced IoT solutions for industries large and small. Precision farming makes practices more controlled and accurate when it comes to growing crops and raising livestock. Smart IoT applications like sensors, robotics, variable rate technology, soil moisture probes improve visibility of soil and crop health. Use of IoT for energy companies for better management of assets and operations, flexibility to accommodate new energy sources, enhanced security and reliability. Enhance productivity and efficiency, solve critical problems and improve real-time decision-making.